Victorian and Edwardian Science Fiction | two men enter . . .
I’m a bit surprised at the inclusions to the time travel category. I guess I don’t really think of “Rip Van Winkle” or “Some Words with a Mummy” as time travel stories (though they certainly anticipate them). Poe’s “Some Words” is a great, fun story everyone should read, though. It’s a brutal satire of human hubris and teleological thinking, and it shows a side of Poe that too few are familiar with. I’m also surprised at the brevity of the Utopia/Dystopia category, especially given how many of them were written in the 19th c. I’m not going to try to put together a full list (that can be found elsewhere), but News From Nowhere really ought to be added, at the very least. There are, however, texts on the list that also fit this category but are placed elsewhere (“The Machine Stops,” The Iron Heel). A bit toward the end of the era, and it’s a play, but one of the most important early 20th science fiction texts. 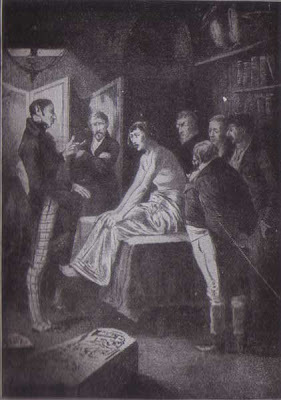 From a production of R.U.R. A bit dry, but at least book 1 is a must-read for those interested in the post-apocalyptic genre. Important and overlooked American post-apocalyptic novel. Anticipates Earth Abides (amongother things). I only picked this particular Lovecraft because it is clearly science fiction (whereas a lot of other possible choices are more debatable, which is one of the reasons I love weird fiction). Lovecraft, and probably a few of his contemporaries, deserve a mention on this list even if they represent a shift away from the era in question. Along with Bellamy’s Looking Backward, one of the two most important utopias of the 19th c. Also, historically interesting beyond politics in its influence on the garden movement during the era. A dialogue rather than a traditional “story,” here we have some of Poe’s philosophical musing (as seen at greater length in Eureka)in a post-apocalyptic setting. Great teaching text. One of the craziest books from the era . . . in a good way. In my book, this is the most glaring omission from the list (I know it wasn’t intended to be comprehensive, but still). Arguably the first dystopian novel; highly influential. I initially thought it was too late to make it on, but the list extends later than its composition (and suppression) and the publication of the English translation (in 1924 by Gregory Zilboorg). That’s all I can come up with off the top of my head and by looking at my dissertation-related (ie, post-apocalyptic and dystopian) bookshelves across from where I’m sitting, but I’m sure there are others. Fair point; both R.U.R. and We are decidedly modernist works (Lovecraft . . . not so much). I would, however, ask whether Forster’s “The Machine Stops,” which was included in the original list, isn’t also modernist despite its early date of publication. 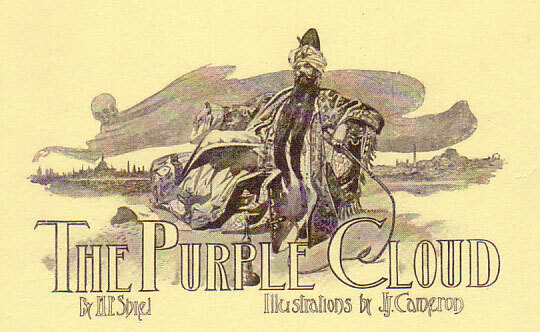 Thanks for mentioning Shiel and “The Purple Cloud”. Shiel had an interesting life to say the least, and the Purple Cloud in particular is a fascination reflection of his character. It does fit under the umbrella of Science Fiction but sits more comfortably as Fantastic Fiction, along with authors like David Lindsay. Wow, I forgot all about Lindsay. Voyage to Arcturus is going on my need to re-read shelf.